Successfully Added Teclast P80H Android Tablet - 8-Inch Display, 1280x800 Resolution, Google Play, OTG, HDMI Out, Quad-Core CPU, Dual-Band WiFi to your Shopping Cart. 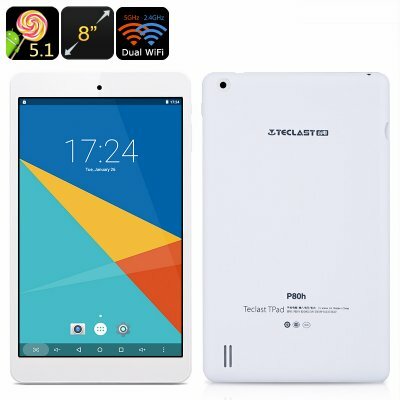 The Teclast P80H is a highly affordable Android tablet that is perfect for anybody out there who is looking for a compact 8-Inch tablet PC that can be conveniently used for business, study, and entertainment purposes. With its Android 5.1 operating system, this budget tablet computer offers a smooth and powerful performance that comes packed with numerous of the latest features. Its 8-Inch HD display, portraits all media in beautiful 1280x800p (WXGA) resolution thanks to which it allows you to enjoy your favorite media, online games, and mobile applications in stunning detail and vivid color. With Google Play installed, you will be able to download all your favorite kind of mobile entertainment for free – assuring that you’ll never have to be bored again. Packing a powerful 3500mAh battery, the Teclast P80H is an Android tablet that supports up to 3 hours of continuous usage time. Whether you need a compact device to make notes during your upcoming business meetings or university lectures, or simply are looking for an 8-Inch tablet on which to enjoy some great games and browse the web – this tablet PC is guaranteed to meet all your demands. With 8GB of internal storage and 32GB of external memory support, the Teclast P80H brings along plenty of space for you to store all your media and files alike – assuring that you’ll never have to worry about running out of storage. With its Quad-Core CPU and Mali T720 graphics unit, this budget tablet PC is capable of dealing with the latest applications, games, and media without dropping a frame. No matter the type of mobile entertainment you’re interested in, this 8-Inch tablet is guaranteed to deliver a smooth and absolutely stunning media experience. Featuring a micro HDMI port, the Teclast P80H additionally allows you to hook up your tablet computer to your big screen TV or PC display – letting you take the most out of all features this budget tablet has to offer. Added to that, this beautiful 8-Inch tablet computer furthermore supports OTG, allowing you to connect it to external hardware devices such as a keyboard, hard drive, or gamepad. Featuring Dual-Band WiFi, the Teclast P80H delivers lightning fast internet speeds. Whether you simply like to browse the web, stream movies online, or download the latest applications – with this stunning 8-Inch Android tablet a slow and laggy internet connection will be an issue of the past. Along with its 0.3MP front snapper, it furthermore lets you engage in high-quality online video calls with al your friends, family and loved ones at any given moment. The Teclast P80H comes with a 12 months warranty, brought to you by the leader in electronic devices as well as wholesale electronic gadgets..